Graphics card is one of the most power hungry components for any computer whether gaming PC or a work PC. The power requirements of a graphics card depend on the GPU model used, because graphics cards with budget or entry level GPUs consumes less power, whereas mid-range and higher end GPUs needs significantly more power to operate. Entry level or budget mid-range graphics cards draw their power from the motherboard’s PCI-E x16 slot only, that can provide up to 75W of power to the graphics card, whereas powerful mid-range and high-end graphics cards are more power hungry and requires additional power from the PSU or Power Supply Unit in form of 6-pin and 8-pin PCEe connectors for their working. It is very important to select proper power supply for your graphics card because if you get and under-powered PSU then it will not be able to supply enough power to your graphics card and other components, causing restarts or can burn out too and may cause damage to your other computer components including the video card. On the hand if you get a higher wattage or overpowered power supply then it will be just waste of your money. Therefore, it is very important to find a proper balance between price and power consumption, so that you can buy the right power supply for your graphics card. So, here in this post I am going to guide you on how you can choose a proper power supply unit (PSU) for your graphics card. Here are the most important things that you must consider when getting a new PSU for your new graphics card. The first and foremost thing to do is to check your GPU or graphics card power consumption specified by the manufacturer on their website. 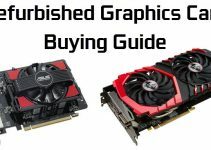 All the GPU manufacturers or graphics card manufacturers list the power consumption and the recommended power supply for their graphics cards. For example, below you can see the recommended PSU for the Gigabyte GeForce GTX 1060 G1 Gaming 6G graphics card on the Gigabyte’s website. The recommended PSU specified for this card is 400W. 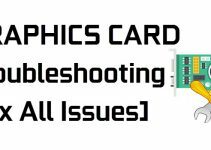 You can look this information for the graphics card you have or that you are going to buy. This will give you some idea about the wattage of the PSU that you will need for your graphics card or whole PC. If your graphics card requires external power connectors such as 6-pin or 8-pin PCIe connectors then you have to buy a power supply with these connectors included in it. Most of the budget level graphics card do not require external power from the PSU but powerful mid-range and high-end graphics cards does require 6-pin/8-pin PCI-E power connectors from the power supply. Also, it is better to buy a PSU with 6-pin/8-pin connectors even if your graphics card do not need them, because of future expansion. 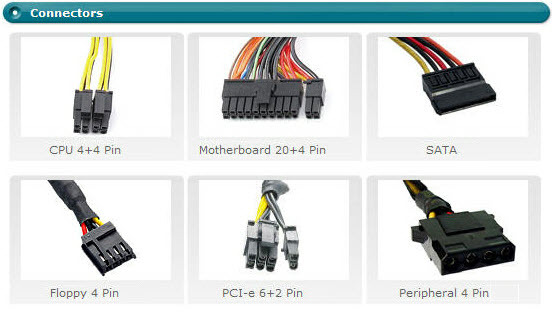 You can check this info on the graphics card manufacturer website that whether your graphics card need 6-pin/ 8-pin power connectors or not. Technically, the most important thing to look for in a PSU is the amount of current present on 12V rail. 12 Volt Rail is the most important and it is the one that provides power to your main components that include graphics card, processor, motherboard, hard drives, fans etc. If you do not have sufficient current on the 12V rail of your power supply then you can face serious performance issues, restarts and may end up burning your power supply and causing damage to your precious and expensive components. 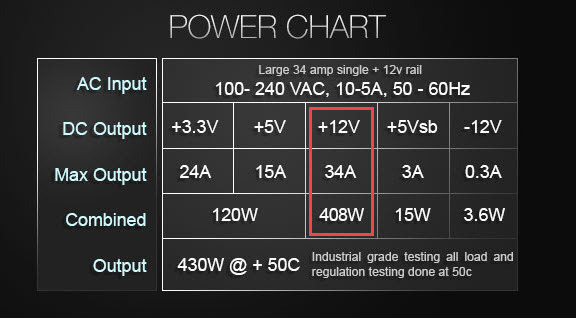 For a 400W PSU it should be at least 30A, 40A for 500W and so on. I am telling you this because I have seen may power supplies with higher wattages but very low current on the 12V Rail, so my advice is to avoid these cheap power supplies with lower 12V rail current rating. Tip: It is better to get a PSU with single 12V rail over multiple or dual 12V rails because it is said that a single 12V rail provides better overall stability under heavy load. Make sure the power supply you are getting should be able to fit in your computer case, because you really don’t want to face such issues afterwards. For a normal ATX cabinet, a normal ATX PSU is good but for some mini-ITX cases, you need a SFX PSU and for slim low profile cases, you need TFX PSU. Always go for a branded power supply if you care about performance and well being of your computer components. Cheap Unbranded Chinese power supplies may attract you at first, but in the end they are nothing but trouble. Branded PSUs may cost a little higher but they are very reliable and provides you accurate current, voltage and power that are needed for the long life of your PC hardware components. Some of the good brands of power supplies are Seasonic, Corsair, Cooler Master, Antec, EVGA, Thermaltake. Lastly you have to asses the total power consumption of your PC, if you have more hard disks or case fans installed in your PC. You can do this by using power supply calculator tools available online or can ask here. If you have a normal PC with two case fans, two hard drives then you can go with the same wattage power supply that is recommended by the graphics card manufacturer on their website. If you have extra components installed then you can add 100W to the PSU wattage which is recommended by your graphics card manufacturer. This is really not an important factor but if you have an 80 Plus Certification power supply then it will be more power efficient compared to the ones without it. This means your PSU will draw less power compared to the PSU with same wattage. The various 80 Plus certification ratings in decreasing order for a power supply are 80 Plus Titanium, 80 Plus Platinum, 80 Plus Gold, 80 Plus Silver, 80 Plus Bronze and 80 Plus White. If you are still unsure on what capacity power supply you should get for your graphics card then you can ask your query here by completely listing your budget, PC specs including the model of your graphics card. I will be happy to recommend you the best PSU for your graphics card or gaming needs. and should I get a cpu cooler other than the stock ? Any good 400W or 450W PSU should be enough for your PC. I recommend EVGA 450 BT, 80+ Bronze 450W or Corsair VS450. Also, i would certainly get a better CPU cooler for better performance and lower thermals. I suggest Cooler Master Hyper 212 EVO or CRYORIG H7 CPU Cooler. You can get it at https://graphicscardhub.com/budget-cpu-cooler/. Well, looking at your specs, 550W should be enough for you. However, there is not much of a price difference between 550W and 650W models, so getting a 650W would be more beneficial for future & for overclocking, if budget is not an issue. I have a 7 year old HP PC. It came with an Nvidia GeForce GTX 550 Ti. This card has 1GB RAM and a 6 pin power connector. The power supply is rated at 460 watts. I seriously need to upgrade the video card to one with more memory. However, it seems all today’s cards have 8 pin power connectors. I know I can get a 6 pin to 8 pin cable adapter. I am looking at some cards (ASUS) that recommend a power supply of 450 watts or more…but they have 8 pin power connectors. How much of a risk would I be taking trying to use a card like this in my PC? Do you know of any current cards that have 6 pin power connectors? Thanks!! I suggest you to go for GeForce GTX 1050 Ti (4GB GDDR5) as it does not require any external PCIe connectors and is way powerful than GTX 550 Ti. Also, it can run very well on a 450W PSU because of its lower power consumption. 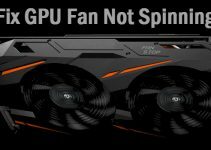 Here are some good ones at https://graphicscardhub.com/best-gtx-1050-ti/. My personal recommendation would be Zotac GeForce GTX 1050 Ti. Actually I already pulled the trigger on a GeForce GTX 1060 SC GAMING Graphics Card. This card has 6GB and looks to meet my PCs power requirements/restrictions. Nice choice. It requires only 6-pin connector and a good 400W PSU. By the way, what is the name of your PSU?